Sultans of Swap - Explaining $605 Trillion of Derivatives! Every parent has had that moment when their child asks them the simplest sounding question but in that instance before you respond, you realize you have never really thought about it and actually don"t know the real truth. To not have an answer would be to lose all credibility as the "all knowing" parent. Like generations of parents before you - you bluff! When asked why there are $605 Trillion derivatives outstanding (1) how do you articulate an answer to this horrendous and almost unimaginable number? The US is the largest economy in the world but tallies only 2.3% in comparison. 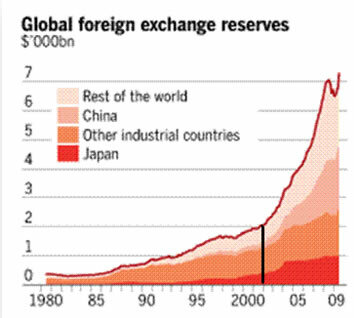 Global bank reserves amount to only 1.2% of this accumulation. The gargantuan size appears to defy all logic. Before some of you experts out there accuse me of sensationalism let me quickly give you the response of the "all knowing" to knock this number down to something that is intended to allow you to once again sleep at night. First $605 is the notional value. This number according to experts (2) is best used simply to get an indication of how rapidly the overall derivatives market is growing (wow) since it doesn"t represent the value of what is at stake to the parties engaged in the transaction. It double counts positions, doesn"t represent what changes hands and doesn"t discount hedges that offset each other. What we need to consider is settlement amounts if all the contracts had to be settled today for some unknown reason (i.e. a 1930"s bank holiday crisis?). Our number then drops to just over $25T. That sounds better but still is a staggering figure considering the assets of the US are estimated to be $56T and is 1/3 of global assets (3). Not to be deterred our "all knowing" experts would then assuredly point out that actually the number is a mere $3.7T when all the contracts directly offsetting each other are netted. Appeased, our cocktail chatter would resume in a much more subdued tone. Or should it? I have been thinking about the truth regarding this imponderable for a few years now. I have likewise successfully answered the question at numerous polite social gatherings but never felt comfortable with my response. My credibility intact I would scold myself to delve more thoroughly. While authoring my recent article 8 Fault Lines in the Euro Experiment which was prompted by the debacle in Greece, I found myself like Archimedes the Greek before me, shouting Eureka - I have alas found it! But before I share the "all knowing truth" with you I must caution those with weak hearts and small children: parental guidance is advised! In 2007 I authored another paper entitled "8 Years of Pain". It called for a US housing collapse and a resulting derivatives implosion. We sort of got the score right but the lyrics were wrong. Similar to the Titanic, we knew Icebergs were out there but we didn"t have the required instruments needed to identify it clearly with sufficient precision. In hindsight we now realize it was because we still weren"t aware of exactly how banks were using SIV"s (Structured Investment Vehicles) to sell CDOs and protect themselves with CDSs. The mechanics of how Toxic instruments were actually being created wasn"t readily available in the public domain. These instruments had yet to have the media spotlight shown on them as they lurked quietly through dark waters. We knew of SPE"s (Special Purpose Entities) from the Enron debacle, so we suspected something similar but we could only speculate. The puzzle we had was that $437T of the $605T of the notional value of derivatives outstanding were Interest Rate Contracts and $342T of these were specifically Interest Rate Swaps with a Gross Market Value of $13.9T. Calculations indicated there was insufficient cross border corporate and financial sector needs for this level of exchange - by orders of magnitude. In our modern monetary fractional banking system money can only be borrowed into existence. It can only be created through the act of lending. By facilitating the ability to lend, money can and is created. It takes three elements for this to occur: 1) A lender with the ability to lend, 2) A borrower with a need and 3) The same borrower with sufficient collateral to actually secure the loan. Almost all Sovereign Treasuries have the continuous lust for borrowing and historically almost unlimited public assets to pledge as collateral. The problem is neither the need nor collateral. The problem is public perception as viewed through the optic lenses of public sector accounting standards. Circumvent the restrictive public accounting standards and Eureka - we have a lender. Like Enron it was about circumventing private sector accounting standards through off balance sheet SPE"s. In the financial crisis we found it was the banks circumventing banking capital accounting standards by off balance sheet SIV"s. In both instances it is motivated by the advantage of removing obligations from the reported asset / liability ledger. This is precisely the brew the great Merlins - like Goldman Sachs have delivered to Sovereign powers as the magic elixir for public accounting standards. Our political leaders like Enron executives and bank executives before them have become drunkards on the magic elixir. It gives politicians (the ultimate alcoholics) the power to take on more debt without impacting the traditional metrics which increase borrowing costs. Like the song "Love Potion #9" - "let"s mix some up right here in the sink". Securitization is about turning revenue streams or "receivables" from time dependent assets into securities. Whether it is accounts receivables through ABSs (Asset Backed Securities) or mortgages through MBS"s (Mortgage backed Securities) the basic concept does not change. Securitization requires a future payment stream (scheme) that can be secured and has a securing collateral value. It didn"t take creators long to understand that corporations had only so much receivables and there was only so many mortgages that could be sold. 1 You take a sovereign Government that needs money but is restricted from lending further. 2 You then create a PPP: Public Private Partnership as the mechanism for involving the private business sector in public sector projects. 3- You also create an SPC (Special Purpose Company) that will represent the private sector business sector interest. 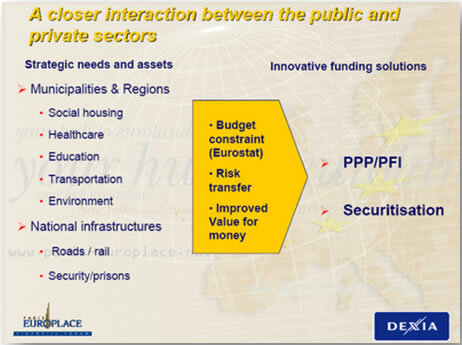 4- You further create a PFI: Private Finance Initiative in which the public and private sectors join. They join (some might use the incorrect terminology: to collude but this is incorrect since all this is still legal) to design, build or refurbish, finance and operate (DBFO) new or improved facilities and services to the general public. 6- So far we have established something similar to a "reverse mortgage". As every financial advisor knows, reverse mortgages hide truly significant financing costs from the unsuspecting or desperate. The banks" Reverse Mortgages prey on the elderly the same as the SPC-PPI/PFI preys on the hapless political apparatus desperate for unpublicized solutions to their prolific spending and irresponsible election promises. With campaigning never ending and governing never beginning, the politicians of today no longer step up to the unpopular choices required of sound fiscal policy. The next step is a little trickier. You need to pay particular attention as we move from the counter mixing area for our "love potion" to the sorcerer"s boiling pot. We have solved the two elements associated with the borrower but the real trick is solving the lenders ability to continue to lend the absolute amounts of money these high powered brews deliver. 7- The next step is to add the secret ingredient. It is a combination of the old reliable SPV (Special Purpose Entity) but in this instance specifically called a Swap Agreement Securitization SPV (i.e. Titlos PLC). With it you add a hardening catalyst called the NOVATION AGREEMENT. You then let the brew simmer ensuring it is available when the central banks says they are ready for a serving. Let"s define some of our ingredients. Novation is a term used in contract law and business law to describe the act of either replacing an obligation to perform with a new obligation, or replacing a party to an agreement with a new party. In contrast to an assignment, which is valid so long as the obligee (person receiving the benefit of the bargain) is given notice, a novation is valid only with the consent of all parties to the original agreement: the obligee must consent to the replacement of the original obligor with the new obligor. A contract transferred by the novation process transfers all duties and obligations from the original obligor to the new obligor. For example, if there exists a contract where Dan will give a TV to Alex, and another contract where Alex will give a TV to Becky, then, it is possible to novate both contracts and replace them with a single contract wherein Dan agrees to give a TV to Becky. Contrary to assignment, novation requires the consent of all parties. Consideration is still required for the new contract, but it is usually assumed to be the discharge of the former contract. Novation is also used in futures/options trading markets to describe a special situation where the clearing house interposes between buyers and sellers as a legal counter party, i.e., the clearing house becomes buyer to every seller and vice versa. This obviates the need for ascertaining credit-worthiness of each counter party and the only credit risk that the participants face is the risk of clearing house committing a default. Clearing House puts in place a sound risk-management system to be able to discharge its role as a counter party to all participants. The term is also used in markets that lack a centralized clearing system (such as the swap market), where "novation" is used to refer to the process where one party to a contract may assign its role to another, who is described as "stepping into" the contract. This is analogous to selling a futures contract. A Repurchase agreement (also known as a repo or Sale and Repurchase Agreement) allows a borrower to use a financial security as collateral for a cash loan at a fixed rate of interest. In a repo, the borrower agrees to sell immediately a security to a lender and also agrees to buy the same security from the lender at a fixed price at some later date. A repo is equivalent to a cash transaction combined with a forward contract. The cash transaction results in transfer of money to the borrower in exchange for legal transfer of the security to the lender, while the forward contract ensures repayment of the loan to the lender and return of the collateral of the borrower. The difference between the forward price and the spot price is the interest on the loan while the settlement date of the forward contract is the maturity date of the loan. Many central banks are "banks" in the sense that they hold assets (foreign exchange, gold, and other financial assets) and liabilities. A central bank's primary liabilities are the currency outstanding, and these liabilities are backed by the assets the bank owns. Although central banks generally hold government debt, in some countries the outstanding amount of government debt is smaller than the amount the central bank may wish to hold. In many countries, central banks may hold significant amounts of foreign currency assets, rather than assets in their own national currency, particularly when the national currency is fixed to other currencies. 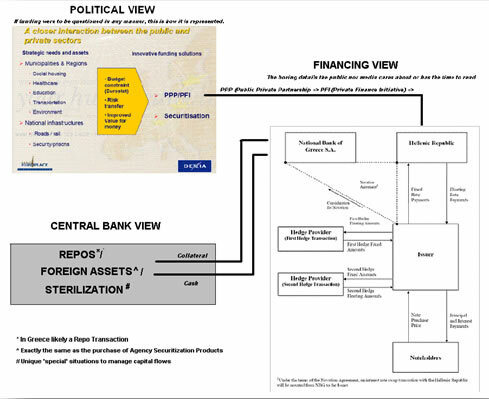 In the financial literature, a term commonly used to refer to a central banks operations which mitigates the two potentially undesirable effects of inbound capital (currency appreciation and inflation) is sterilization. Depending on the source, sterilization can mean the relatively straight forward re-cycling of inbound capital to prevent currency appreciation and / or a wide range of measures to check the inflationary impact of inbound capital. The classic way to sterilize the inflationary effect of the extra money flowing into the domestic base from the capital account is for the central bank to use Open market operations where it sells bonds domestically, which soaks up cash that would otherwise circulate around the home economy. However this can be inefficient if it causes interest rates to rise and hence encourages even more inbound flows. A variety of other measures are sometimes used. 8- When the Central Bank issues Repos the bank (in our example above - the National Bank of Greece) then pledges the SPE assets as collateral. Presto, the bank has high powered money which can lent out at fractional reserve leverage of approximately 10 X leverage. We have taken future tax streams similar to "receivables" and turned them into securitization products. The government gets upfront cash today along with tax streams going to cover needed principle/interest payments. They face balloon payments in the future. The real benefit to the banks is they get the full value of the asset today which they can use as capital ratios along with ability to fractional lend out 10 times the value of the deposit streams. The deposit streams would be similar to the deposits you make from your payroll and then spend. The banks float is increased and thereby its lending facility is increased. PRESTO - Money is created into existence! PPP"s are so broad based that this is how Geithner proposed to get the Toxic waste off the public books - business as usual. This allows the International Banks to effectively become mini Federal Reserves, lending money into creation by being ready whenever ANY global central bank is ready to expand their money supply. Like the US Mortgage bubble they can"t get enough product. Why is everything hidden in the murky depths called "special" - like SPE, SPV or "Structured" - like SIV? The answer is to keep them off the balance sheet. Why would you not want something on the balance sheet where investors and interested parties could see what is happening? Obviously so you can camouflage them from what is happening. The reason is fundamentally Credit Ratings. Keep your debts low and your credit ratings high and the cost of money is cheap. The cheaper money is, the more borrowing will occur. Everyone is happy except the unwitting lender. It is here ladies and gentlemen that we discover the Sultans of Swap. The Bond Vigilantes are of a previous era. They are dead - RIP. Through the magic mix of Credit Default Swaps, Dynamic Hedging and Interest Rate Swaps the Sultans of Swaps effectively control interest rate spreads. Through Regulatory Arbitrage they extort tremendous political sway globally. They live in the world of risk free spreads. Low interest rates simply attract more volume for their concoctions. 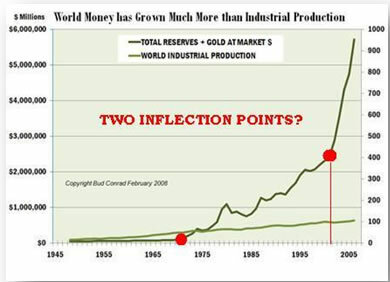 We have had an explosion in Money Supply globally as the charts (right) indicate. The parabolic rise matches the increase in these derivative products along with their ability to turn Interest Rate Swaps into high powered bank lending. Like Achilles Heel in Greek mythology, there is an exposure. Everything is based on tax payers paying, GDP expanding and interest rates staying low. Titlos PLC shows severe structured collateral calls when these assumptions change even modestly (5). With $3.7T in Gross Derivative Credit Exposure outstanding, how many Greek Sovereign downgrades would it take to begin cascading collateral calls? Don"t forget that we have witnessed dramatic shortening of government "duration" over the last few years. There are massive "rollovers" looming that will further compound rates and their associated collateral requirements. One final point, I need to be really clear here. Nothing is actually hidden in all this. It is typically there in the small type footnotes that are extremely difficult to interpret or referenced to a document that is difficult to get your hands on. With enough time and efforts you can get the facts. Also it is incorrect to consider that the actions undertaken are to "evade" laws or regulatory guidelines. They are done to avoid regulatory hurdles. I need to differentiate this because it is what the lawyers always point out. I will leave it to others why people might want to worry about the wording of what are clearly material facts in such a manner. As an investor it says to me simply - Caveat Emptor in bold letters. Like Archimedes the Greek before me, I discovered the answer in Greece - Eureka! (2) 10-15-08 $596 Trillion! How can the derivatives market be worth more than the world's total financial assets? (5) 02-15-10 Is Titlos PLC (Special Purpose Vehicle) The Downgrade Catalyst Trigger Which Will Destroy Greece? Mr. Long is a former executive with IBM & Motorola, a principle in a high tech start-up and founder of a private Venture Capital fund. He is presently involved in Private Equity Placements Internationally in addition to proprietary trading that involves the development & application of Chaos Theory and Mandelbrot Generator algorithms. © Copyright 2010 Gordon T Long. The information herein was obtained from sources which Mr. Long believes reliable, but he does not guarantee its accuracy. None of the information, advertisements, website links, or any opinions expressed constitutes a solicitation of the purchase or sale of any securities or commodities. Please note that Mr. Long may already have invested or may from time to time invest in securities that are recommended or otherwise covered on this website. Mr. Long does not intend to disclose the extent of any current holdings or future transactions with respect to any particular security. You should consider this possibility before investing in any security based upon statements and information contained in any report, post, comment or recommendation you receive from him.